The kitchen is arguably the most important room in any house, so it isn’t surprising that when it comes to updating or modernizing their homes, many people want to start there. The problem is that modernizing your kitchen can be extremely expensive. Kitchen remodeling projects can end up costing anything from $15,000 to $50,000 and that’s a lot to spend on one room. Fortunately, there are easier ways to update your kitchen without spending a fortune. While the kitchen can be the hub of any household and the place where your family spend a lot of their home time, it is also a functional room and ensuring that your appliances are up to date is a good place to start with your kitchen modernization. That may not mean replacing your appliances, but it is a good time to consider tackling those minor mechanical faults your appliances have developed from oven problems to dishwasher troubleshooting. There are plenty of handy guides out there to help, for instance, you can check out this Choice Home Warranty guide for troubleshooting dishwasher issues. One of the quickest and most effective ways to update your kitchen is to swap out the handles and pulls on your kitchen cabinets. The end results can be striking and if you opt for colorful options or brushed nickel finish handles, you will instantly give your kitchen a modern look. This may not be something you have thought of, but it is a viable alternative to fitting new cabinets, and it can have a dramatic effect. A new coat of paint in a clean, modern tone, perhaps even citrus colors, can really freshen up and modernize a tired kitchen. An alternative to painting your cabinets is to change the doors. For instance, swapping out your current doors for glass-paneled ones can completely change the look and feel of your kitchen. You could even consider getting rid of the doors altogether for a contemporary open-shelf effect. Maybe you don’t want to go to the lengths of painting all your cabinets? No problem. You can paint an accent wall instead. Take one room in your kitchen and paint it a darker tone to the rest of the room. It may not sound that dramatic, but the effect can be stunning. 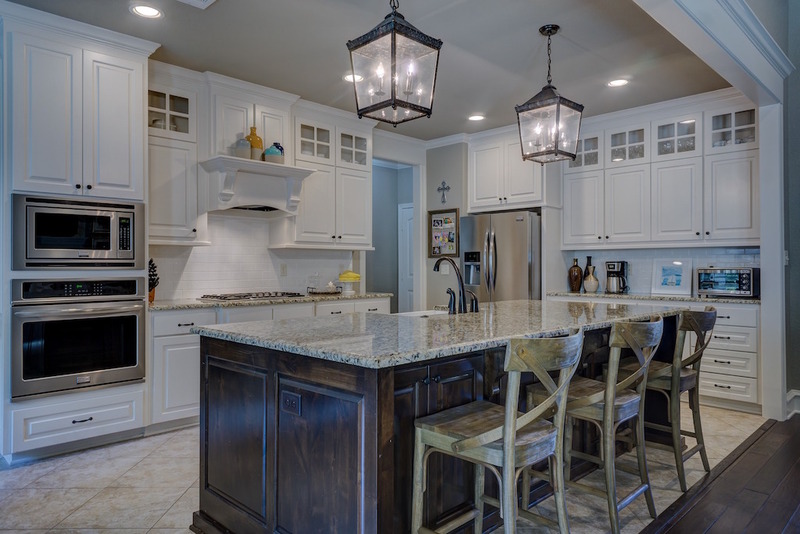 Many kitchens feature old fashioned light fixtures, and these are often the last things to be changed in any remodeling, which doesn’t make sense, because a colorful pendant light can transform any kitchen, and contemporary lighting units can be picked up cheaply online. The kitchen is often the place where the family comes together, so it must be welcoming and cozy, but there is no reason why you can’t also have a stylish, modern-looking room. With just a few strategic changes you can refresh and update your kitchen to great effect.